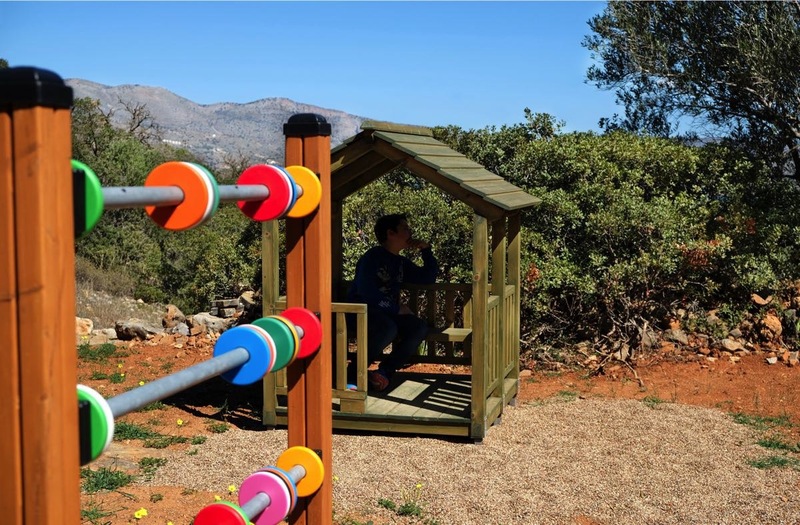 We wanted to improve the facilities for families with children staying at the villas. as we found that many of our guests were family groups. We wanted to offer an area where children could play freely and safely without having to leave the site. The hidden private playground is in between the two villas. Close enough for easy access, but at the same time quite remote and hidden. It is barely visible from the villas due to the surrounding vegetation and terrain. Children playing there cannot be heard from the villas, but at the same time, it is less than five minutes walk to get to it along footpaths from either villa. It is convenient for families who will love to use it as much as possible, yet simultaneously invisible to guests without children. According to international studies, when playing, children practice all the skills they need later in life. Play supports learning, enhances the ability to concentrate and nourishes creativity. Movement is an essential part of children’s play which boosts their physical fitness in a natural way. They offered the ideal designs we were looking for to create a safe and high-quality playground. All their equipment is manufactured in Finland. The timber used blends well into the surrounding environment both in terms of colour and design. They alsocomply with all relevant EU safety standards. Most importantly, the kids that have tried it so far all love it. There are also carefully designed shaded areas for the parents.